Your logo will appear in the top right area of the home page and link directly to your website. You will also receive a custom banner advertisement at the top of our web pages. The banner graphics can be customized with your message and/or promotion. The banner links to your website and appears at random along with other sponsors. Your company name, logo, and brief description will also be listed on our Sponsors page and link to your website. Sponsor also gets 3’x5’ vinyl sign to be displayed at fields. You will receive a custom banner advertisement at the top of our web pages. The banner graphics can be customized with your message and/or promotion. The banner links to your website and appears at random along with other sponsors. Your company name, link, and brief description will also be listed on our Sponsors page. *Website sponsorships last for one calendar year from the time of your donation. WYBSL is embarking on a program to upgrade existing scoreboards and add new scoreboards. 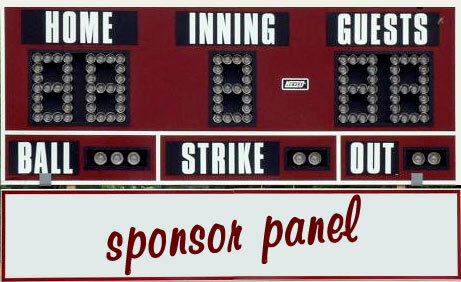 Each sponsor will have a sponsor panel attached to the top or bottom of scoreboard as shown to the right. Five new scoreboards are needed to make this program a reality. 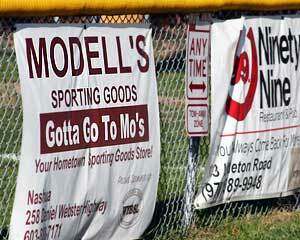 This is a high visibility sponsorship opportunity to be displayed permanently on one of the ball fields. This requires a four year commitment of $1,250 per year. At the end of four years, the sponsor will be given first opportunity to renew advertising on the scoreboard. Website listing on sponsor page included. Snack Bar Sponsor $1500 - Only 1 Available! WYBSL is offering one prime sponsorship location – above the snack bar window. One lucky sponsor will receive a 3’x6’ sign over the snack bar window. This area is visited by 4,000-5,000 people on typical WYBSL Saturday game day. Website listing on sponsor page is also included. Each Slugger sponsor will have a 3’x5’ vinyl sign displayed all day Saturday in the snack bar area. This area is visited by 4,000-5,000 people on typical WYBSL Saturday game day. Website listing on sponsor page is also included. $350 is for spring season, $500 is for spring, summer and fall. This level helps sponsor one team.